The Norton Museum of Art in West Palm Beach is home to the most important art collection in Florida, and Foster + Partners has just been selected to add an extension that will help make it the state’s leading cultural institution. The masterplan, which was unveiled by Norman Foster in Miami, features three bold new pavilions, a shimmering roof that covers them all, and nearly twice as much gallery space as before. In addition to art, the museum will be updated with new public facilities, allowing it to play host to community events throughout the year. The museum was originally laid out by the architect Marion Sims Wyeth as an elegant series of Art Deco-inspired single-storey pavilions around a central courtyard. Expansions since then have changed the original east-west axial arrangement, and the museum’s main entrance shifted to the side of the building. The new plans will reinstate the main entrance on South Dixie Highway to the west, which means visitors can once again see through the entire building via a new, transparent grand hall and refurbished glass and iron courtyard doors. The reinstated entrance is signalled by three new double-height pavilions, unified with the re-worked existing wing by a shared palette of white stone. 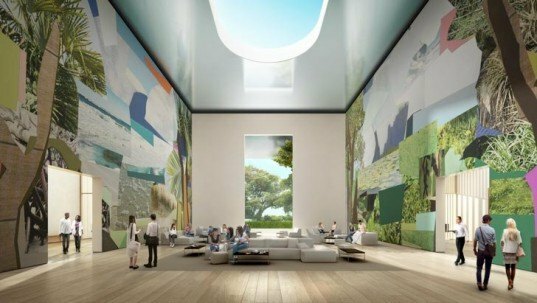 They will house a state-of-the-art auditorium, event space and a “grand hall,” which will serve as the social heart of the museum. A museum shop and restaurant with al-fresco garden seating will also operate independently of the museum, allowing them to function day and night. A metal roof canopy floats above the pavilions, offering a unifying feature and providing shade for incoming guests. Its gently tapered nature visually reduces its profile and provides enough stability to withstand hurricane winds. The canopy’s gentle luster will diffuse patterns of light in an abstracted reflection of people and flowing water below, while linear pools create a tranquil setting for the entrance plaza. A curved opening in the roof accommodates the branches of a mature ficus tree and a further light well above the lobby illuminates and defines the new entrance. 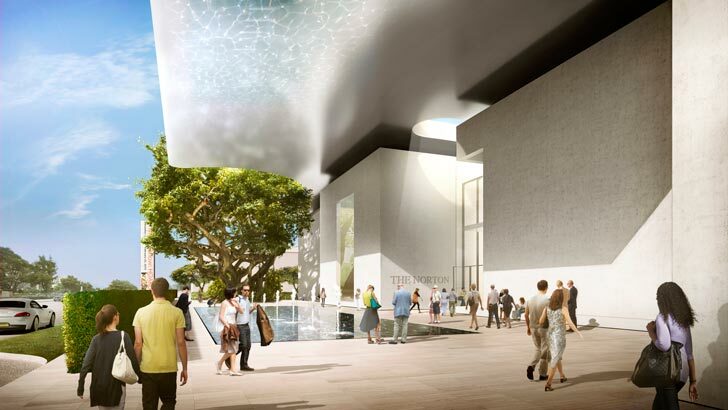 The Norton Museum of Art in West Palm Beach is home to the most important art collection in Florida, and Foster + Partners has just been selected to add an extension that will help make it the state's leading cultural institution. The masterplan, which was unveiled by Norman Foster in Miami, features three bold new pavilions, a shimmering roof that covers them all, and nearly twice as much gallery space as before. In addition to art, the museum will be updated with new public facilities, allowing it to play host to community events throughout the year.